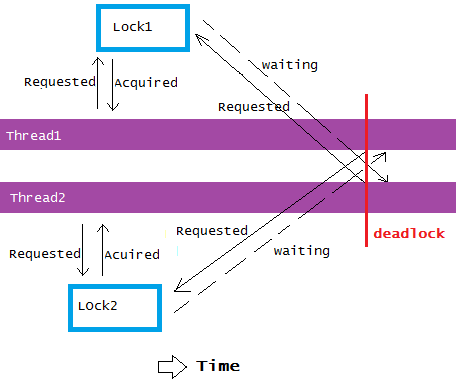 Java - Thread Deadlock example. How to prevent them? A deadlock is a situation which occurs when a thread enters a indefinite waiting state because a lock requested is being held by another thread, which in turn is waiting for another lock held by the first thread. If we run above code multiple times there are good chances that we will have a deadlock soon. Deadlocks only occurs at some unfortunate timing of the two or more threads. When that happens, the program stops progressing at a particular point. It doesn't always necessarily hang or freeze. In above simple example though, we will experience a freeze when deadlock happens. I'm able to have the deadlock at the first attempt. I'm using windows 10 home with a 4 core/8 logical processors machine. It's obvious from the last two lines that the two threads are waiting on the locks which are already held by each other in reversed order. 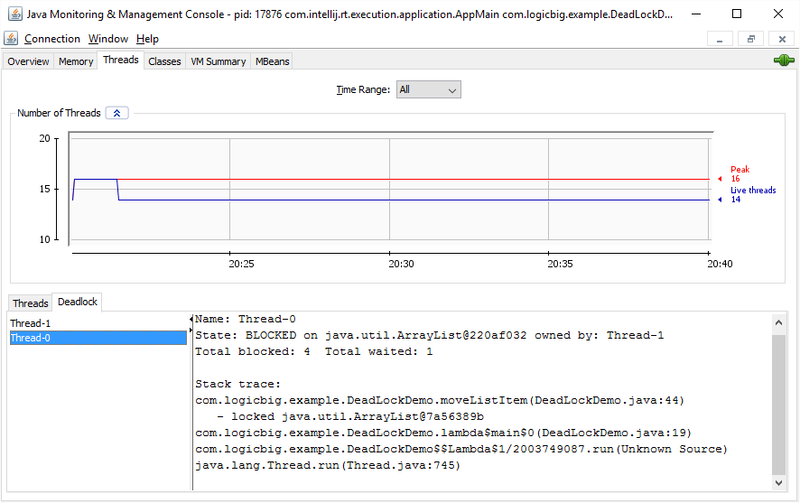 To investigate deadlocks, we can use JConsole. Java doesn't provide any kind of construct or indication to warn about deadlocks during compile time. I guess no programming language can do that. It's the developer responsibility to avoid deadlock scenarios. If a method already holds some locks and it's trying to acquired another lock then it's likely to have some deadlock scenario like we saw above. Another scenario can be directly or indirectly recursive callback to the same method which is holding a lock. There we have to be careful and do some investigations. Deadlocks are not immediately discoverable but we can do some quick tests to avoid them, like we did by introducing the sleep call. To fix above deadlock issue either we have to use finer-grained locking or some sort of composite locking mechanism (just one lock composing of a pair of lists). The method has to be, of course, synchronized on the lists if it's accessed by multiple threads. In other words if we want to make the method thread-safe on the input lists, we need synchronization.